Nvidia has released Mental Ray for Maya 1.2, the latest update to the Maya plugin version of the renderer, and the first compatible with Maya 2018. The release is accompanied by a parallel update to the standalone edition, Mental Ray 3.14.5.1. The headline feature in Mental Ray 1.2 is simply that it’s the first version that works with Maya 2018, Autodesk having opted to stop bundling the renderer with Maya in favour of Arnold last year. The release also adds support for Nvidia’s upcoming Volta GPUs, and discontinues it for ageing Fermi GPUs like its original Quadro cards. Other than that, 1.2 is primarily a bugfix and performance release: Nvidia says that it “significantly improves GI Next rendering performance for complex scenes”, but doesn’t put a figure on the speed boost. 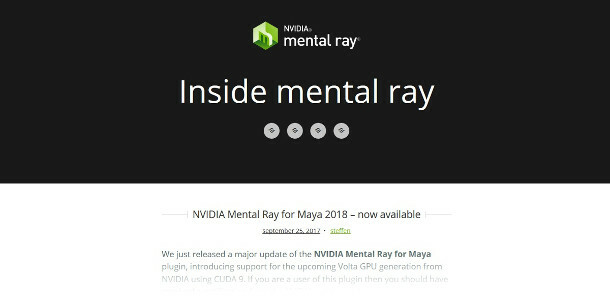 Mental ray for Maya 1.2 is available for Maya 2016 and above, running on Windows 7 or 10, Mac OS X 10.10.5 and above, or Red Hat Enterprise or CentOS 6.5 or 7.2 Linux. The plugin is free for viewport or single-frame rendering; full production licences, which enable sequence rendering within Maya and production rendering on the network, are available on a rental-only basis. Pricing for local licences starts at $95/year if you use one of Nvidia’s workstation GPUs, or $295/year if you use a gaming card. Network licences start at $395/year.